Like most people within the Labour movement I like to think that I’m open to diversity and free from prejudice. Indeed I travel around the country speaking at conferences on diversity and inclusion, within football, within the Labour Party and even within society. I’m an ambassador for Kick It Out, the anti-discrimination organisation that began life 25 years ago as Kick Racism Out Of Football and many of my friends are black professional or retired footballers. Being transgender I am automatically in a minority, I have been the victim of hate crimes, verbal and physical, online and in the flesh. I know what prejudice looks like from my own experience. Growing up in Britain during the 1970s and 80s I saw the race riots, I saw the police brutality and I saw the way that government policies disproportionately affected the young people of colour from our cities. I saw the injustice but I could never understand how it felt to grow up in a society where your worth was immediately and irrevocably diminished by the colour of your skin. 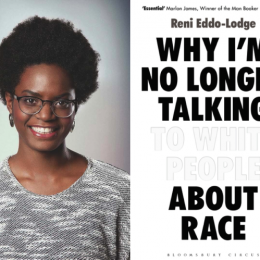 Reni Eddo-Lodge’s ‘Why I’m no longer talking to white people about race’ helped to explain how a history of slavery and institutionalised racism stacked the cards against entire races. How the prejudice acted as a lifelong limiter of expectations both from without and within and showed me the strength and courage that is required to stand up against hatred. It showed me that one of the biggest barriers to breaking down prejudice was the well-meaning but utterly misguided notion of some within the liberal elite that it was all in the past and that black people should get over the ‘chip on their shoulder’ about racist treatment. “It’s all PC gone mad!” I hear them screaming from suburbia. The chapter about racism in the feminist movement was particularly relevant to me. It describes how a group of privileged, white, intellectual feminists decided that they were the sole keepers of the true meaning of feminism, denouncing intersectionality and attacking women of colour for having the temerity to suggest that racism contributed to their oppression. Then, as now, they subscribed to the opinion that there was a hierarchy of oppression. All arguments that have been used in the past about black people, gay people, Jews, Muslims, etc, etc. Some bigotry is born of ignorance, lack of education or awareness, some is unconscious bias, some is born of hate. Reni Eddo-Lodge’s book is a great first step on that journey.